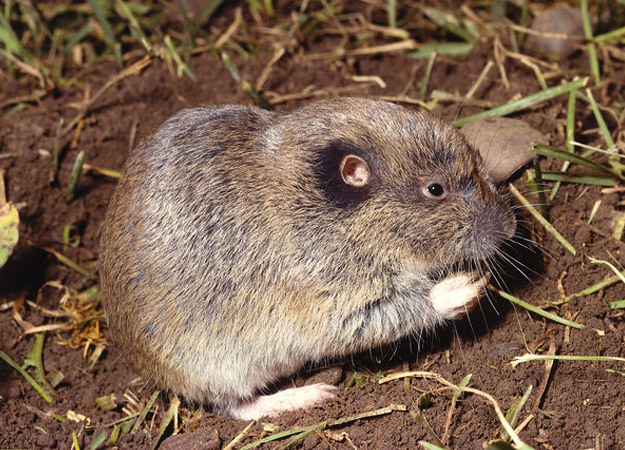 Pocket gophers have large cheek pouches, from which the term “pocket” derives. Their fur-lined cheeks, which can be turned inside out, extend from the inside of their mouth to well back onto the shoulders. They use them for transporting food (a wide variety of plants) back to their burrows. Like prairie dogs, these heavily built rodents are burrowers, but unlike prairie dogs, they have small eyes, poor eyesight and are relatively hard of hearing. To make up for it, they excel at sensing vibrations and finding their way by touch. They have a short, hairy tail that they use to feel their way around tunnels when walking backwards. Solitary creatures for the most part, they will aggressively defend their territories, but often fall prey to patient predators like bobcats.